"The carefully selected verses found in the Holy Scriptures to justify the superiority of men owe more to time and place - and the determination of male leaders to hold onto their influence - than eternal truths. Similar biblical excerpts could be found to support the approval of slavery and the timid acquiescence to oppressive rulers...The truth is that male religious leaders have had - and still have - an option to interpret holy teachings either to exalt or subjugate women. They have, for their own selfish ends, overwhelmingly chosen the latter." Carter is right. The truth is that there is no shortage of sound Biblical and theological scholarship to help us see that the Biblical text at least need not be read from a chauvinist perspective (one good chapter is V.P. Furnish's "Women in the Church" in his book, The Moral teaching of Paul) but a great many church leaders have ignored them and a vast number of male and female Christians have remained uninformed of these perspectives. What can we do about this? How can we remain faithful to God's proclamation through Paul that "there is neither... male nor female, for you are all one in Christ Jesus"? 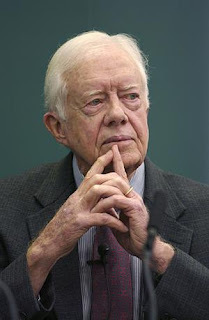 Perhaps Jimmy Carter has showed us one option. It's good to see that someone is standing up and making this a public thing. It is an issue that needs to be brought to the forefront.